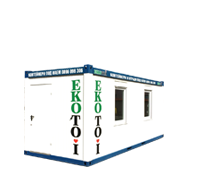 EKOTOI offers different types of containers for rent. We can construct a container town depending on your project and your needs. All the containers are conformable to the European standards. We can provide them with electricity, clean and drinkable water and we can ensure the safe and correct disposal of the wastewater. Furthermore, we can clean your office and storage containers and we are able to deliver coffee and soft drink/snack vending machines.